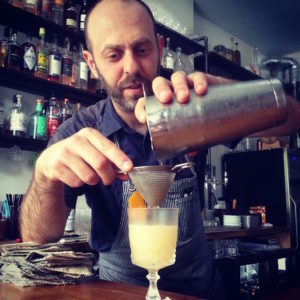 Cocktail blogger turned author turned bartender, Fred Yarm made the move from scribe to shaker with a first stint at Russell House Tavern. Now, he can be found at Loyal Nine, applying his research skills (in his past life, he was a lab scientist) to the wide world of beverages. Below, he gives some thought to his favorite drink order, the camaraderie of the Boston bar scene, and the spirits that need a little more limelight. How did you get involved in restaurants and bartending? I was a home enthusiast with a penchant for writing about things. My journaling spawned a blog that later spawned a book (Drink & Tell: A Boston Cocktail Book). Once that book came out, opportunities to do talks arose, and one night they got me behind a bar for a bartender-pairing series. That night was so amazing that I knew that I ought to pursue bartending as a profession; I started at the bottom as a barback and worked my way up. What’s your favorite drink to make? Least favorite? How do you feel about the ‘mixology’ movement? I definitely appreciate the many ways that bartenders choose to elevate the craft of bartending both in focusing on the person and the drink. In terms of drink, if the bar can churn out amazing libations even on a busy Saturday night, then they have done the craft a great service. (Putting the drink above the guest can do the opposite though.) We are involved in a people and experience industry first and foremost with the product being utilized to support the idea. One of the great aspects of the Boston drink scene is the collegial and non-competitive air of the bartenders in sharing recipes and techniques as well as promoting other establishments to their guests. By a bartender sitting at other bartenders’ bars, there is a group learning effect whereby good hospitality and drink making skills can be gleaned. In that way, Boston bartender culture has grown into its own identity in a rather positive way. What’s on your home bar? My home bar represents about 13 years of spirits collecting and hovers around 300 bottles not including bitters and syrups. Champagne has been a solid go-to for special occasions, and I always have a few unique beers aging for when the time is right. Are you excited about one spirit in particular? Is there something really underrated, in your opinion? Rum is definitely one of my fascinations. There’s such variety in flavors, aromas, styles, body weights, and uses, and the art of blending is not restricted to the distiller. (Tiki legend Don the Beachcomber once said, “What one rum can’t do, three rums can.”) I would say that grape brandy is underrated both in cocktails and in drams. With the exception of a few cocktails and a few applications like an after-dinner sipper, brandies from unaged expressions to rather old Cognacs and Armagnacs ought to play a bigger role in the drinking world. What’s something you wish the average guest knew about your job? The majority of the time, the job is nothing like the rockstar mystique portrayed in the Tom Cruise movie Cocktail, but perhaps closer to the Heywould Gould book that the movie was based off of. True, the bartender is essentially on stage and big cocktail competitions have made some bartenders famous, but a great bartender is trying their hardest to make the guests’ experience the best given the constraints of the evening. It is hard work both mentally and physically throughout the shift and there is a lot of time spent preparing and breaking down on either side of the guest experience. These days, bartending is more than a side gig, but a profession with a lot of historical roots and one that can be taken quite seriously once again.